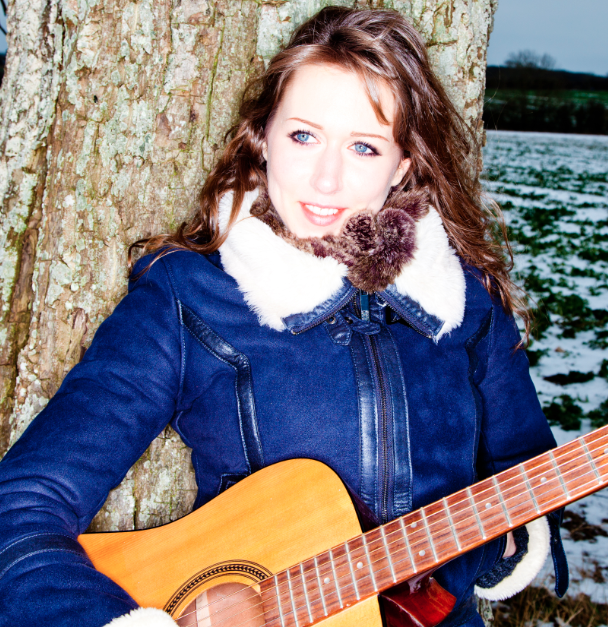 I had discovered Ilona’s music early on during my return to new music discovery. In fact, her CD Thunderstorm was the second CD I purchased from overseas. I had also tweeted quite a bit about Ilona’s music as far back as January 2014, and she often replied with thanks. But we really didn’t start communicating until after I ordered the CDs and they failed to arrive. Sound familiar? (It would if you read Road Back #6.) Yes, twice I ordered CDs from the UK from different bands, and both times they failed to arrive the first time. In any case, thus began our communication, as the method I chose to reach out and ask about the CDs was managed by Ilona herself, not her management. Many months later, when Ilona came to the U.S., I tried to connect her with one of my industry contacts. Though it fell through in the end, I was able to be free from work on the day of her showcase, and she invited me to attend. Technically, I had already decided to start the blog by this time and had set October as the launch date for the blog, but if I hadn’t already decided, this cool event almost certainly would have “sealed the deal.” First, I received an incredibly warm welcome from Ilona, her band, and her management, even though I was “merely” a former music journalist who tweeted occasionally. I’ve been treated well on a variety of occasions with just that background, but it’s still the sort of thing that reminds me how many wonderful, nice people there are in the music biz. Second, wow, it was a very cool event. I’ll review Ilona’s outstanding performance below, but yes, this is the sort of thing that reminds me why I was involved in music for so many years, and it absolutely would have been the final push needed for my decision to return if I hadn’t already made that decision a few weeks earlier. 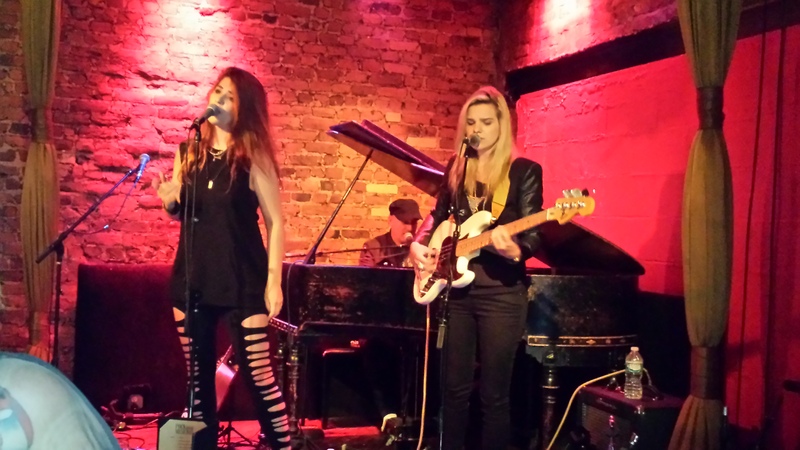 The night — or late afternoon, perhaps — kicked off with Ilona’s Rockwood Music Hall showcase. She performed a short set for a small, invited audience. The songs I recall from the set were two that show off Ilona’s incredible power vocals, energetic mid-tempo pop-rocker “Back to You” and powerful ballad “I Still Fall For You,” plus her latest single at the time, the countrified crooner “Beautiful Country.” During the set, Ilona showcased her vocals, which are every bit as strong live as they are on her recordings, and her stage presence, as she shares her engaging personality with the crowd in such a way that she naturally wins over the audience. 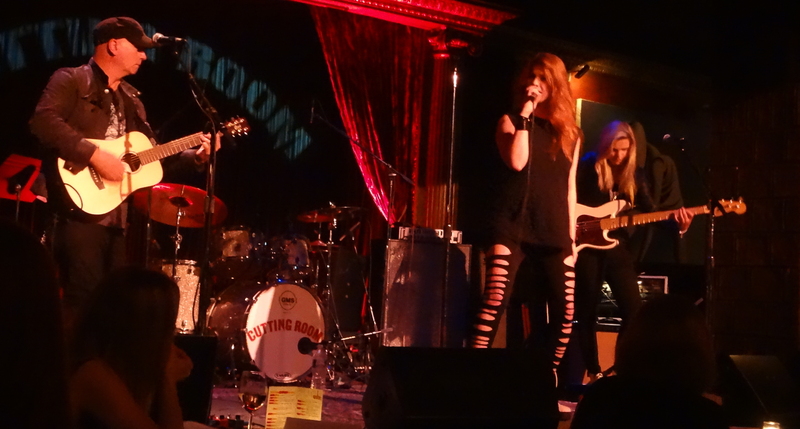 Later that night, Ilona had a relatively early set at The Cutting Room, and she rocked the crowd, giving another solid, skillful performance. Much of the set was similar to the showcase set, but she also trotted out “Wrong Places,” a song she ably uses for crowd participation purposes and for which she shot her most recent music video. 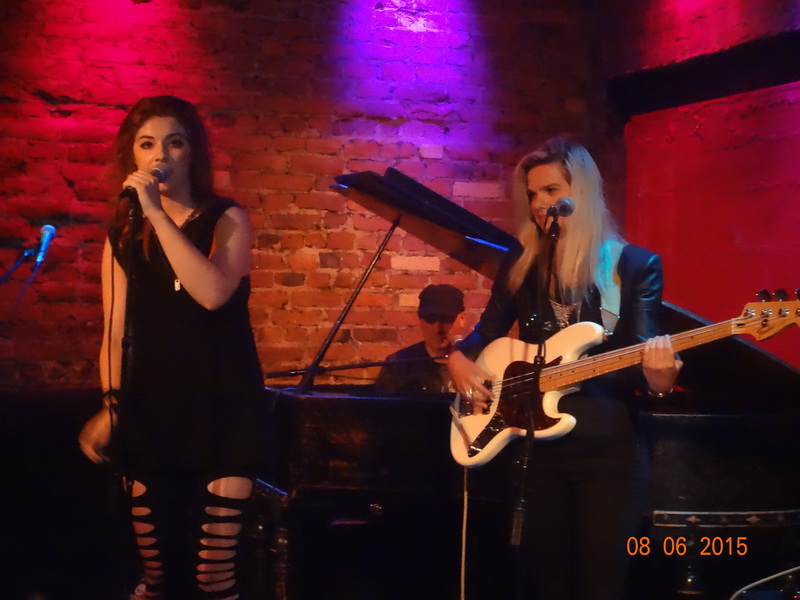 For both shows Ilona was flanked by Tony Moore on guitar and keys and KT Parker on bass. Ilona also swings a little mellower, especially with a couple of her more recent top trackes, which would place her squarely in the style of some more adult soft rock radio playlists, as well. Listen to “Back to You,” particularly the tuneful vocal wail at the 2:30 mark of the song. (In the “Back to You” music video, it’s at the 2:43 mark.) That’s a power rocker’s vocal chops with a balladic pop/rocker’s sensibilities. “I Still Fall For You” is similar. And, of course, “Beautiful Country” is a country-themed slow song. 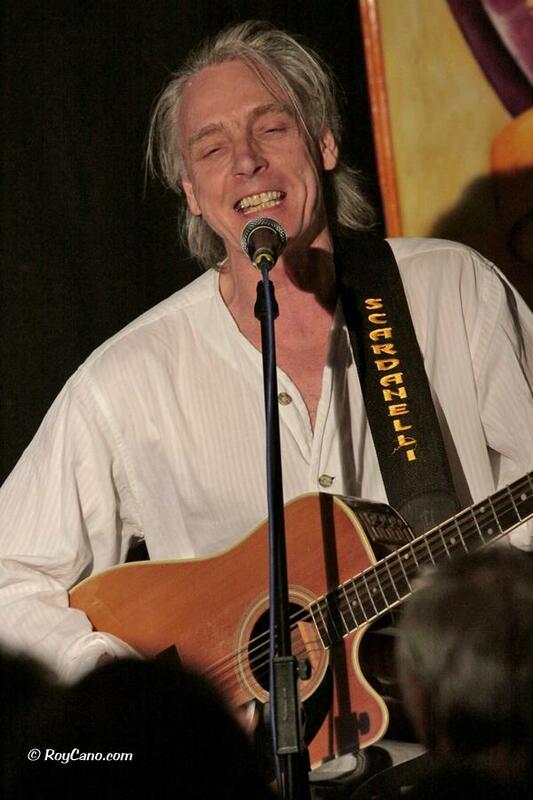 Fast songs, slow songs, and an instantly-identifiable, exceptionally expressive, raspy, amazingly powerful voice. Ilona impresses more with each listen, and impresses even more if you’re able to see her perform live. She’s a unique, one-of-a-kind talent with a trademark sound. Exactly the sort of artist worth checking out. My Return to Music Journalism is Complete; What’s Next for the Blog? Those are the nine steps that brought me back to music journalism. Starting tonight, October 27th, I’ll be kicking off a series of 5 nights in London with coverage of Bob Malone’s concert at the 100 Club. On Thursday, October 29th, I’ll be at the Troubadour to hear Sonya Titus, who you may recognize as the subject of article #4 in the “road back” series. I’m still deciding where to go each of the other three nights, but I do intend to tweet about it. So if you’re in London, come out and catch some great music with me. After that, I’ll work to get some additional writers involved, and the blog will become its long-term self, a mix of song/album reviews, live reviews, and interviews. After today, you can expect no more than one article each day, so rest assured if you’re an e-mail subscriber, you won’t be inundated. I hope you enjoy, and here’s to a nice, long run! 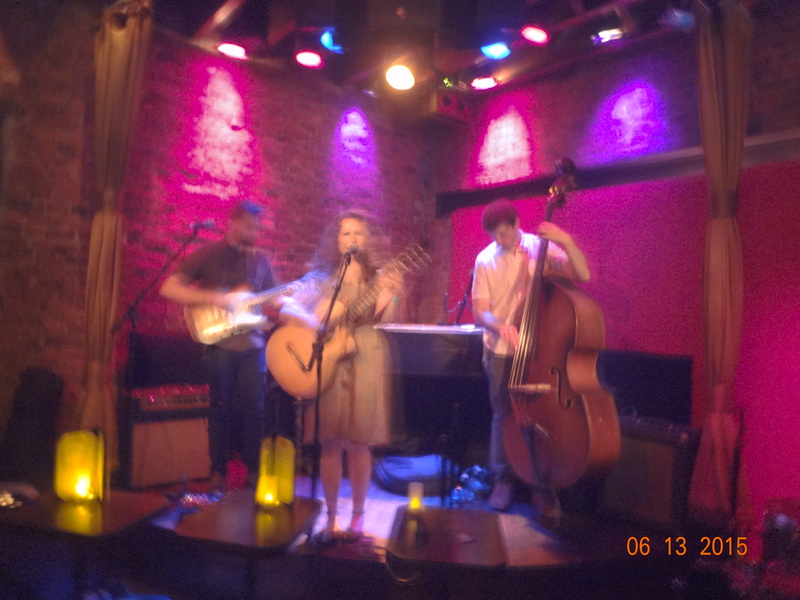 I was spending a weekend in New York, and the friend with whom I was having dinner on Saturday evening suggested catching a few sets at Rockwood Music Hall. We arrived mid-set for one group and stayed for two more. 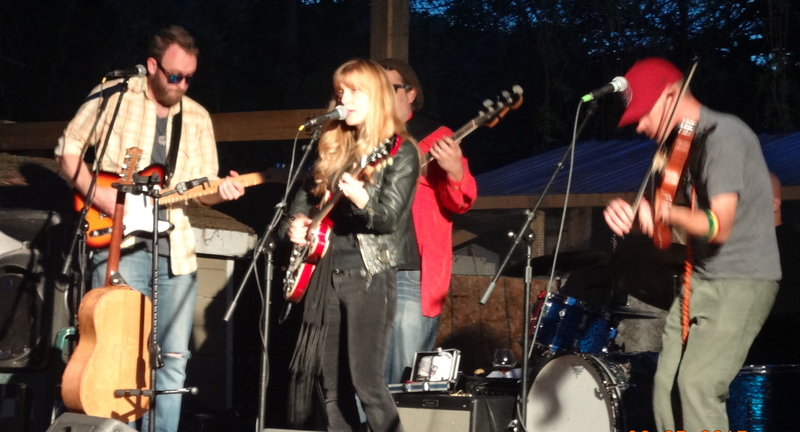 The second of the three groups that evening was Bridget Davis and the Viking Kings. Between sets, I found myself standing next to Bridget and struck up a conversation, complimenting her on the band and offering a couple thoughts I had during the set. Even in the decade-plus away from music journalism, I still always examined the music I listened to; I wrote reviews in my head whenever I was at a show or spinning a new CD. And even with all those years away, I still felt compelled to share what I thought, particularly with the musicians themselves. I, of course, was able to quickly share my background, and that has been enough both online and in person to get the attention and appreciation of the musicians with whom I share my thoughts. I enjoy this part of being involved in the music business. And that night in June was no different. First of all, apologies for the blurry photo. I bumped a setting on my camera during the evening but didn’t realize it until later that night. But you can sort of make out Bridget and her bandmates in the picture, can’t you? OK, then let’s start the review. Bridget Davis and the Viking Kings songs’ have what I refer to, for lack of a better phrase, as “engines” – those often-song-long rhythmic hooks that seem to be BD+VKs’ signature (sometimes a bass line, sometimes a guitar line, occasionally drum-based, once in a while even vocal) are the band’s strength, what sets them apart from other bands in their genre. Bridget has great vocals, of course, but I think their songs (not just the songs themselves but their unique songwriting style, namely their songs’ “motors” or “engines” – yes, I can’t decide which word is more descriptive) are their real advantage. Indeed, when I sought out Bridget Davis and the Viking Kings’ music after the show, I started with the most recent EP, January. And I instantly recognized the songs that had drawn me in during the live show, “The Breakdown” – I easily that song’s “motor” from a couple days earlier – and “January.” Also, perhaps “Jonas,” though I didn’t take any notes at the show, so I can’t be sure. But if you want an introduction to the band’s music, there is no better introduction than “The Breakdown.” The song is one long hook, with a pulsing acoustic rhythm you’ll be hearing long after the song is done and vocals that rise and fall perfectly with the melody and as called for in the lyrics. 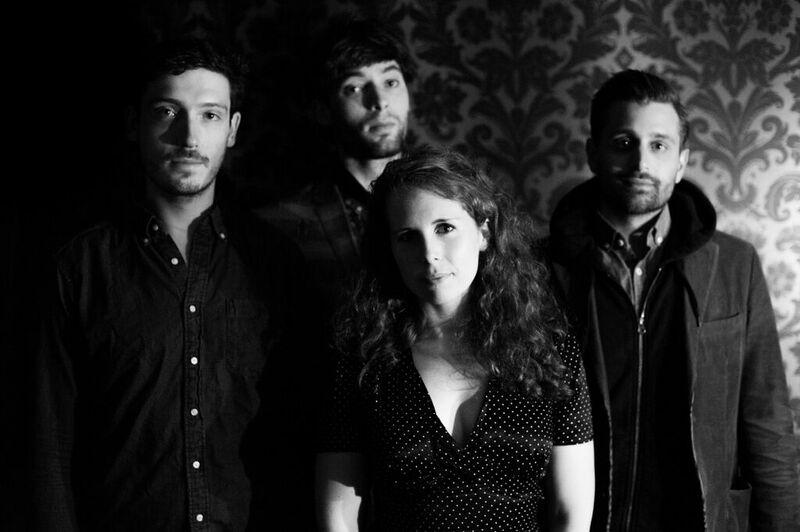 As a whole, the folk-rock style embodied by Bridget Davis and the Viking Kings – a sort of alt-rock folk with a pinch of Americana – tends to be song-driven rather than vocalist-driven. And while Bridget’s voice is sweet and clear with an odd waver when called for (well-suited to, perhaps, a Chris Isaak style tune), it’s not the band’s calling card. In fact, it’s just a part. It’s the songwriting, notably the hooks (or “motors”), that define BD & the VKs. This is a band whose music – as expressed through its well-crafted songs – is the reason you can identify the artist so easily when you hear the songs. And I give the group immense credit for forging its own path; I’ve heard so much folk-rock and Americana that just sits on the record sounding pretty but doesn’t distinguish itself. That’s why I’m so high on Bridget Davis and the Viking Kings, a strong band with catchy songs… and a unique sound in a genre in which it’s hard to sound unique. Actually, this is looking ahead to a future article but looking back for the band. About a month ago, Bridget Davis and the Viking Kings released a full-length album, I Wasn’t Planning on the End. My commitment to buy that album when it was released was the last financial musical commitment I made before deciding to return to writing. About a month ago, on the day it was released, I purchased the album. You can look forward to a review of it in the next few weeks. Spoiler alert: I was not disappointed. I can’t recall exactly how I discovered Danielle Miraglia‘s music, but I believe it involved local live show listings (and the subsequent checking-out of bands listed) because I first viewed out YouTube videos before finding Danielle’s Box of Troubles album available online as a free (“name your price”) download. After months of listening to that album on my PC playlist, Danielle had become one of the artists whose recordings I would look forward to buying as soon as it was released, so I took it one step further and pre-ordered her Glory Junkies CD in the fall of 2014; the album was completed and released that winter. The word that best describes Danielle’s vocal style is “can I have more than just one word, please?”. She can rock, she can do sultry, she’s frequently a little raspy and gravelly, she can go extremely bluesy — well, she’s always a little bluesy, but sometimes yowza! Regardless, Danielle’s voice is an unmistakable powerhouse. And most of the time it sounds as if she’s singing with a good-natured smirk. And there’s a good chance that’s exactly what she’s doing. 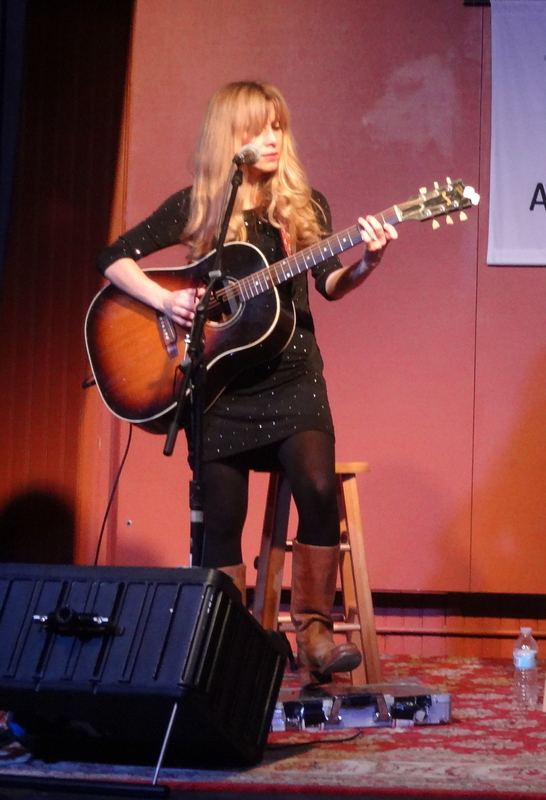 All somewhere on the spectrum from folk to blues-rock to full-on blues, yet every song is identifiably, undeniably, absolutely a Danielle Miraglia song. So once again we return to the dilemma of describing Danielle’s musical style. Blues. And folk. And blues-rock. Not so hard. 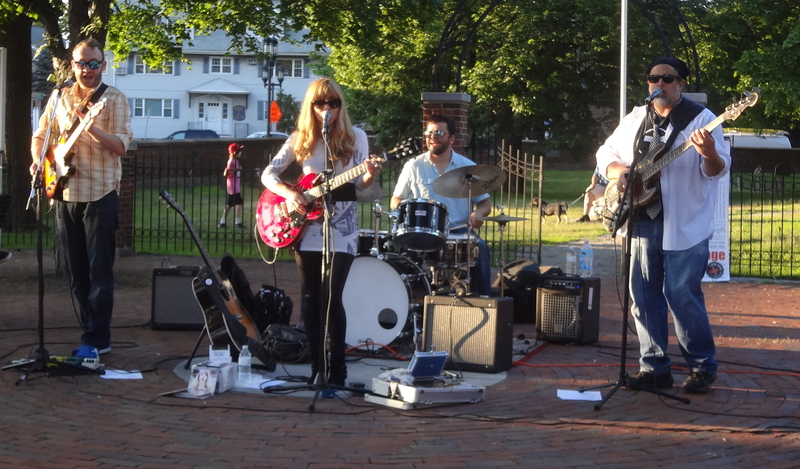 But it’s Danielle Miraglia’s brand of blues/folk/blues-rock. Replete with sarcasm, wit, deep thoughts, great lyrical turns of phrase, and an always-a-little-bluesy vocal style that can navigate all three of those styles (and probably more if she chose to) but still always be undeniably, recognizably her own. 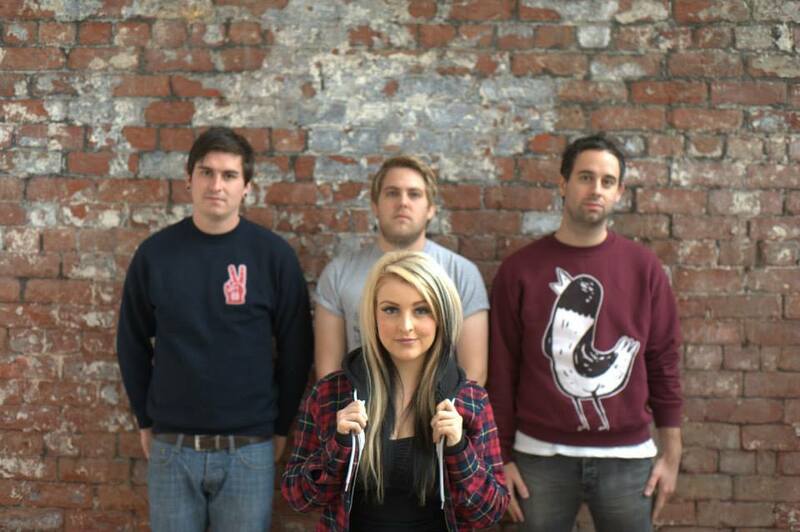 Glory Junkies is a fun disc, a musically, vocally, and lyrically satisfying journey. Of course, with Danielle Miraglia at the wheel, it’s no surprise. 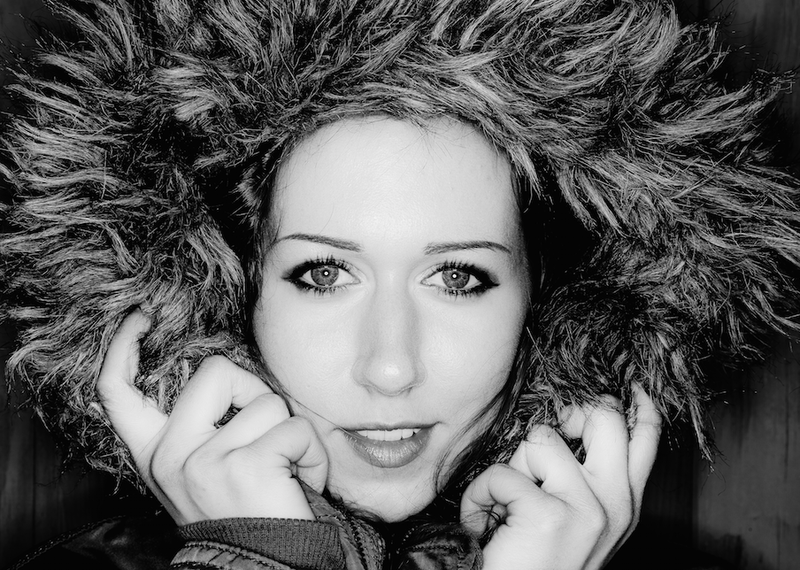 I believe I first discovered Marina V via ReverbNation. The website has rankings based on its users’ listening habits and preferred artists. Occasionally during the early days of my music rediscovery when I was actively searching for new music, I would check the charts of major entertainment cities (Los Angeles, New York, Boston, etc. ), figuring if someone was among the best there, perhaps they were worth checking out. Marina V sat high among those rankings in Los Angeles. Upon hearing her music, I was quickly impressed. 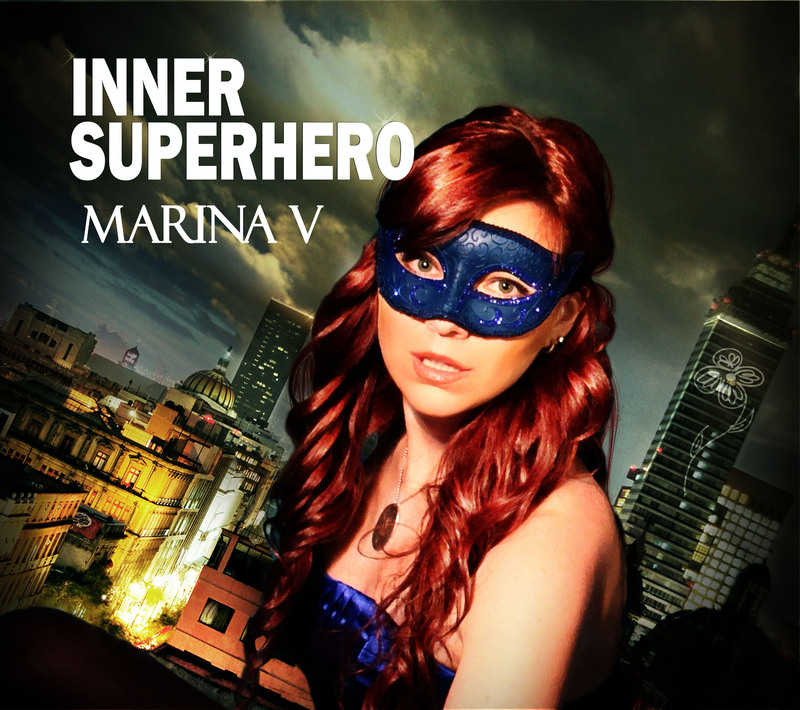 In the spring of 2014, after listening to Marina V’s songs that were available for free download for several months, I ordered her Inner Superhero CD. It was the first CD I had ordered online directly from an artist. A few months later, I attended a house concert hosted by one of Marina’s supporters in Boston. It was an intimate affair; in fact, during the evening Marina commented that it may have been the lowest attendance she’d had at a house concert. But a small event with before- and after-concert mingling (much like a backstage event at a concert, but much smaller) was a great initial house concert experience. This was my first CD purchase directly from an artist, which is nice. The house concert was a bigger deal, as it was the first extended time I’ve had to talk with one of the musicians I had discovered since returning. To that point, my circle of music contacts still consisted entirely of people I had gotten to know during my first stint in the music business. But the house concert sparked a desire for the first time to write a live review of the concert or to arrange an interview to help the deserving musician-in-question get more exposure, to the extent I could, wishing with greater desire than I had for years that I still published a newsletter with distribution within the music industry. So yes, this was another step that increased my desire to get back into writing/publishing. The house concert was fun, but I didn’t take notes and didn’t plan to write about it, so the review will be minimal and purely from memory. It was a small event, with everyone bringing snacks and wines, a lot of mingling before and after the show. At such a small event, Marina and her guitarist/husband/co-collaborator Nick Baker were able to have nice chats with everyone in attendance. Some of the attendees had discovered Marina many years earlier and had attended many similar events, so they were recalling old times. The show itself was quite energetic and dynamic, especially considering the size of the venue. Marina played favorites old and new. There was audience participation, including the passing around of small tambourines. Indeed, “Sunshine Guaranteed” was a big crowd-pleaser. And I was particularly impressed with the acoustic arrangement she and Nick were able to come up with for one of her more rocking songs, “Win.” Overall, an outstanding performance, one worthy of any venue from a living room to a concert hall. Marina V’s Inner Superhero album is another step forward in what was already an award-winning independent music career filled with memorable songs. 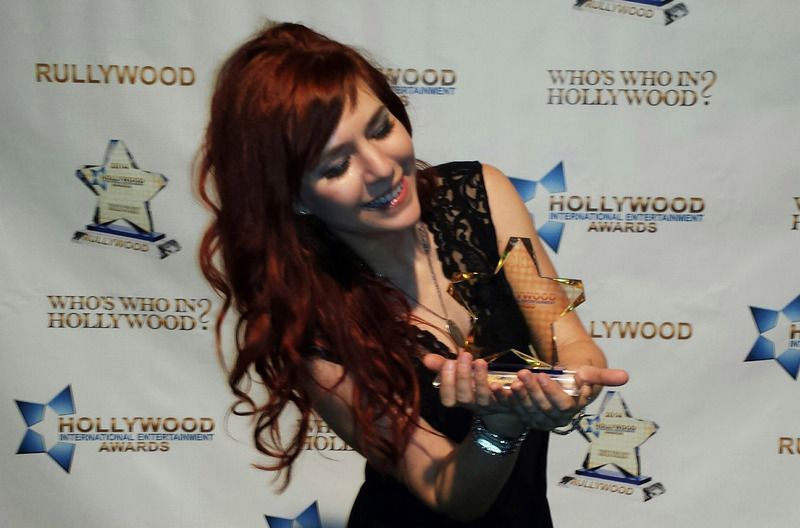 As a performer and songwriter, Marina remains one of LA’s award-winning best kept secrets, at least beyond her lucky core market, though the fan base she has built through the years is admittedly relatively large for a still-independent musician. Musically, Marina’s songs tend to be mostly soft rock, though she proves on occasion she can clearly really rock a room when she decides to; vocally, she tends to be a mix of sweet and sultry, while occasionally unleashing her vocal power. The first four songs on Inner Superhero showcase Marina’s stylistic range. The album kicks off with “Hello,” a song that opens with piano then builds to persistent, pleading musical and vocal power. It’s a great kickoff, followed by “Run,” which may be the best song to start with if you haven’t previously heard her music. This is an extremely well-written soft pop/rock number that ought to grace soft rock radio playlists. The verses open with effective use of Marina’s trademark breathy, sultry vocals, then build along with the music. The verses, the chorus, the transitions… this is songwriting! But that’s not the song that won me over. Instead, it was the following song, “Win,” that convinced me of Marina’s versatility, talent, ability to occupy a broad enough range of musical space to produce an album that would appeal to a broad audience and that would have staying power across multiple listens. Dude, “Win” has some chops. It’s an attitude-filled, mid-tempo, arena-worthy anthem that would be an excellent choice for an ESPN college tournament end-of-day sports montage. Fourth track “Stand,” meanwhile, is a powerful piano ballad with a message that features some of Marina’s soaring vocals. The rest of the album remains solid, as well. Depending on my mood and time of day, one of those might also be my favorite. “Stand,” for example, is perhaps the most powerful ballad on the disc. And Marina’s delivery-with-a-smile adds something really special on light, cheerful tracks like “Light Up the Dark” and “Say Hello.” In fact, watch this video of “Say Hello.” Between the cheerful song and video, I guarantee you’ll be grinning from ear to ear. Considering her talents, Marina may have an interesting dilemma in her career, though it’s one I think she can navigate easily enough if she maintains the sort of balance found on Inner Superhero. 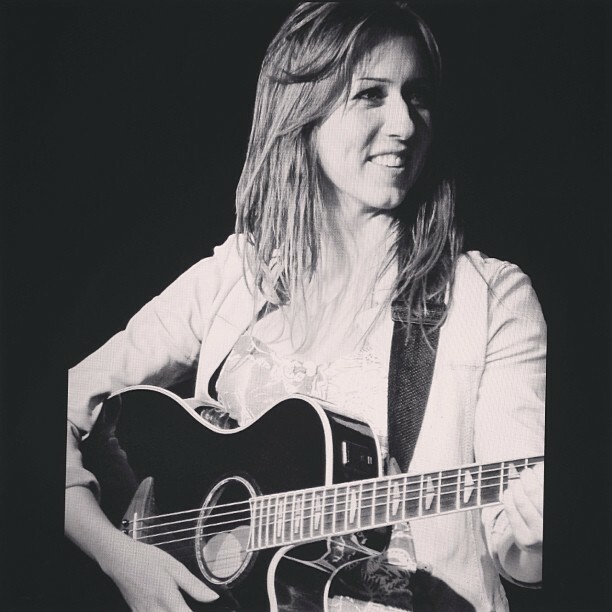 Her distinctive vocal style lends itself to almost-folky soft-pop/rock in such a way that she likely has built a significant fan base that clamors for that sort of song; meanwhile, she has the versatility as a singer and songwriter to reach farther and wider with her music, occupying the much broader singer/songwriter (and occasionally rockin’ signer/songwriter) category. I suspect a mix as found on Inner Superhero can satisfy both audiences; I, of course, count myself among those who, while appreciating a mix of the softer stuff (and she does deliver it amazingly), think Marina really sets herself apart when she mixes in the occasional more rocking number like “Win.” Combine Marina’s world-class songwriting with her vocal and performance style that seems to connect directly from artist to each individual listener (whether live, on video, or on her recordings), and she’s just “exposure” away from much greater success. I just thought I should share that I am a supporter of Marina V via her 2-songs-a-month club, albeit at the most minimal level. Because I “joined her club” while I was not an active music journalist, I plan to continue to honor this commitment going-forward. From a broader perspective — listen up independent musicians — this is a great idea, one that allows her supporters to pledge as little as one dollar per song (which is two dollars per month) in exchange for two songs a month. I think this is something other independent musicians should consider duplicating, if it suits their schedule and career objectives. Marina releases one new original and one new cover song each month. I suspect other artists who may not be such prolific songwriters could substitute a heavier mix of covers, if necessary. As a result, for artists with a large enough following, this could provide a reliable source of secondary income in addition to the usual performance, recording, and merchandise income that’s typically more sporadic. Something to consider, though if you, as a musician, do something like this, you’ll need to dependably follow through. After all, you’re making a commitment to your fans when you do this. I think I originally ran across Sonya Titus thanks to a promoted post on Facebook. She has released music on Red Dragon Records, and I was targeted by Facebook with one of Red Dragon’s sponsored links. I think this was because I had previously followed a link from publisher Allen Foster’s Songwriter’s Monthly (when he was publishing it online) about one of Red Dragon’s other artists. Regardless, I followed the link, heard Sonya’s song “Now,” and downloaded it. At the time, I was only listening to music from my PC playlist, so I was really only checking out music that was offered as free downloads. If the song sounded interesting, I downloaded it, added it to my daily playlist (which I listened to whenever I telecommuted), and if I liked the song after several listens, it remained on my playlist. Sonya’s “Now” was a song that only got better and more memorable with each listen. As such, it became the first song about which I posted a music review tweet. I’ll focus on Sonya’s studio recordings; in other words, I’ll skip the live recordings. First, let me say that “Now” has strong, soaring pop (slow, soft pop) vocals and is catchy. Oh, did you already read that, perhaps in an embedded tweet? Let’s try again, then. “Now” was the first song I downloaded and listened to. The sound of this mid-tempo soft pop tune alone is instantly captivating. Sonya’s voice soars, and her trademark style is most apparent in her ability to carrying any vowels through multiple notes and, it seems, several-syllables. (In “Now,” though the “ooh”s carry much of the song, if you want to hear what I think Sonya does especially distinctively well, listen for the extended “I”s.) Oh, the overall song — its tempo, the ample soaring vocals, the variety, and the memorable lyrical hooks — are enough to make this perhaps the song of the summer of 2013, if only it had received widespread radio play, but there is something distinctive about Sonya’s vocals, and it isn’t obvious exactly what it is. I may be overthinking it — it could simply be the combination of elements in her distinctive, high, soaring, versatile, sweet-yet-strong voice, but I think it’s most obvious when she extends her vowels. Shortly after I discovered “Now,” Sonya released a video for “Love Transfusion.” This song features more traditionally-structured, straightforward songwriting. With Sonya’s vocals soaring through it, “Love Transfusion” is a heartfelt, memorable love (or not) ballad with dynamic transitions. More recently, Sonya has added two more full original songs, “OK in the Morning” and “Too Late,” to SoundCloud, as well as a cover of “Stay With Me.” The originals are a couple more of my favorites from her song collection. “OK in the Morning” is about what you’d expect, and is a hopeful tune, softly energetic yet mellow but with interesting, dynamic transitions. “Too Late,” meanwhile, opens softly and never really builds much, with her voice sweetly weaving its way through the lyrics. If I were me in charge of ordering the songs on her album, I might close with this, as it would bring a collection of songs to a satisfying conclusion. I almost don’t need to write about the cover — someone with a softly powerful, versatile voice like Sonya’s is bound to do a top-shelf rendition of “Stay With Me,” and she doesn’t disappoint. I have heard the unreleased songs that will eventually complete Sonya’s album, and I can attest to the fact that those yet-to-be-shared are as good as those on SoundCloud, though “Now” is still and will likely always be my favorite. (It has topped my personal playlist for two years now; the song has staying power. So if you spot me around town singing “we are beautiful/just the way we are,” yes, I have this song in my head.) I look forward to being able to review an entire Sonya Titus album one of these days. In the more immediate future, I am excited to finally get the chance to see Sonya perform live. Please come join me on Thursday, October 29th. I’ll be in London, enjoying Sonya Titus’ live performance at The Troubadour. You may recall Simon Scardanelli as part of the 1980s pop group Big Bam Boo. The group had hits that charted in the UK and Canada back in 1989. While publishing Geoff Wilbur’s Renegade Newsletter, in the mid-nineties I reviewed the album Death Row Tales by Simon’s band The Eye Camera. He and I remained in contact through the years. 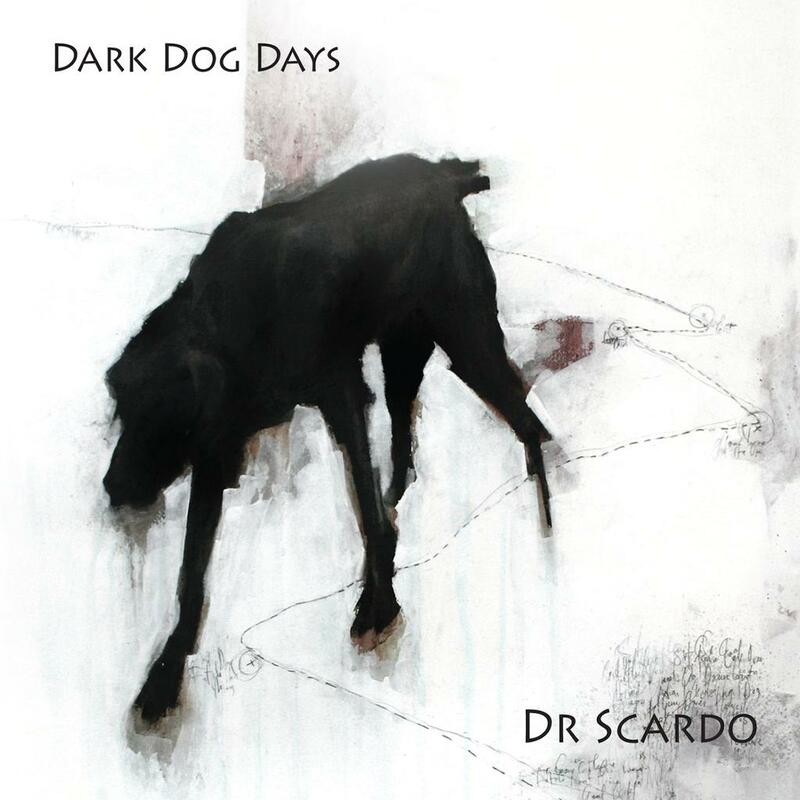 And in the summer of 2013, I spotted a tweet from Simon saying that he was offering a copy of his latest album, Dr Scardo’s Dark Dog Days, as a free download for a week so his fans could check it out. Intrigued, I downloaded it and dove in. This album was the first music I had decided to download based on a tweet. Indeed, I hadn’t been using any online source to find new music. And even though this album was downloaded on a whim, it finally sparked in me a desire to seek out new music online. Partly because it was unlike any of the music I heard on the radio, I suppose, it refreshed my desire to listen to music I couldn’t otherwise easily find. And even though I had known Simon previously, the new music I began to seek out after this was by other artists who I hadn’t previously known about. In fact the rest of my “Road Back” series will be about these other artists, all of whom I’ve discovered since the day in 2013 I donwloaded Dark Dog Days on a whim. At this point on the “road,” I didn’t have even the slightest hint that I would want to write about music again, but the ball was certainly rolling downhill. Dark Dog Days is a powerful statement about the state of the world. It’s a very issue-driven album. It’s dark. It’s often angry, sometimes brooding, other times melancholy, but mostly insistent, as if an album with an opinion, demanding to be heard. 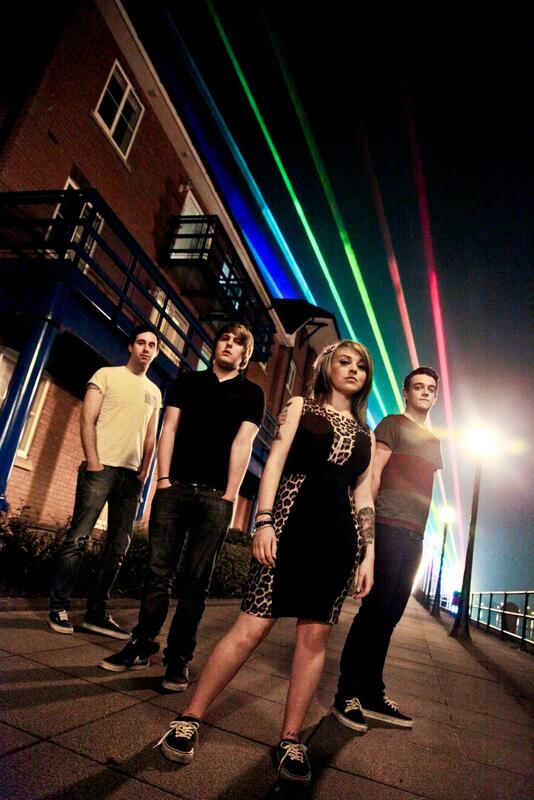 Musically, it’s modern, darkly moody rock with a nod to a synch-pop/rock past. The dark-pop disc-opener, “Leave Us Alone,” is more than just a disaffected youth anthem; it channels the anger of all people marginalized by society. It’s followed by “Wall Street Hustle,” mixing a catchy recurring rhythm and hook into a lyrical soup attacking Wall Street and politicians for their damage to the working population with a tone that screams anger but also carries a hint of resignation about the way the world works. Also worth noting: “End of the World” takes a look at civil disobedience and the resistance of the power establishment to protesters’ interests. “Dark Horse Damned” takes a shot at the overmedication of kids. “Resolution Oil” is a 7-minute, exceptionally engaging epic reproach of the oil industry and its’ impact on the world’s population. Even “If You Could See Me Now,” a 1989 Big Bam Boo song, is given a new, updated, fully modern dark rock treatment, emerging as a sort of slow, insistent, pleading ballad. And finally, the title track takes aim at the way consumer commercialism has overwhelmed people’s lives so much that its importance in people’s lives has blinded them to what’s being done in the world right before their eyes. It’s amazing a nine-plus minute song can seem to go by so quickly, but like everything on the album, it’s well-crafted and features exceptional musicianship. Whether or not you agree with its social commentary, Dark Dog Days, as an album, is an artistic masterpiece.